Last Friday night, the Metropolitan Opera House saw a kooky mix of mavens decked out in cowboy hats, cowboy boots and fringed buckskin alongside bejeweled ladies with silver-haired 'dos. The occasion? 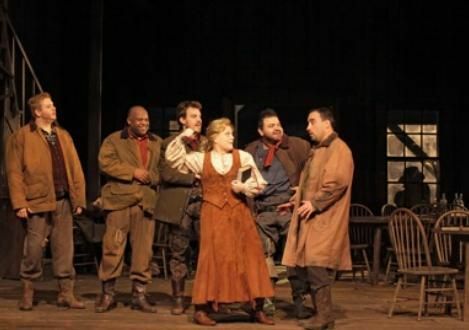 December 10th marked the 100th anniversary of the premiere of Puccini's seldom-seen spaghetti Western, La Fanciulla del West, whose English translation is "Girl of the Golden West." Angela Lansbury and playwright Terrence McNally, sitting side by side in orchestra seats, opted for the traditionally elegant look. The opera is pure entertainment, with cinematic sets of an Old West saloon, a gold mining town and a cabin in the mountains, with snow magically swirling around it. For winter entertainment it's hard to beat, starring the divine diva, Deborah Voigt, and the magnificent Marcello Giordani as her bandit lover. Two beautiful horses also make appearances. Look for several upcoming performances of La Fanciulla del West, whose last show on January 8th will be broadcast live at select movie theaters in HD, on sale now at theaters like the Union Square Stadium 14 and the Ziegfeld.